Height 46", Shoulder 12", Chest 23", Waist 21", Hip 25"
Height 42", Shoulder 12", Chest 22", Waist 21", Hip 24"
Height 51", Shoulder 14", Chest 26", Waist 23", Hip 27"
Mannequin Kids Girl Molded Hair, with Face Fleshtone 50"
Height 64", Shoulder 17", Breast 32", Waist 25", Hip 35"
Height 69", Shoulder 19", Chest 37", Waist 29", Hip 37"
Mannequin Kids Boy Molded Hair, with Face Fleshtone 38"
Mannequin Kids Boy Molded Hair, with Face Fleshtone 44"
Height 70", shoulder 17", Breast 31", Waist 25", Hip 31"
Height 72", Shoulder 19", Chest 38", Waist 31", Hip 39"
Height 75", Shoulder 20", Chest 38", Waist 28", Hip 35"
Height 70", shoulder 17", Breast 33", Waist 25", Hip 31"
Height 70", shoulder 19", Breast 33", Waist 24", Hip 35"
Height 74", Shoulder 21", Chest 38", Waist 29", Hip 36"
Height 74", Shoulder 19", Chest 35", Waist 28", Hip 36"
Mannequin Kids Boy Molded Hair, with Face Fleshtone 57"
Dimensions: Height 29", Chest 20.5", Waist 20", Hips 23"
Mannequins are a key component to any apparel store looking to display their products like never before. 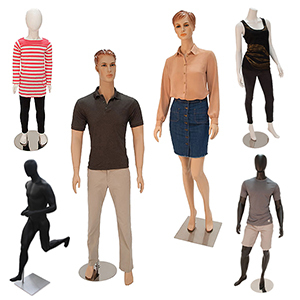 At American Retail Supply we offer a wide variety of Mannequin, giving you the opportunity to design your store and display your products in your own unique way. Most of our mannequins also come with detachable arms, hands, legs & torso, and come with a metal base, rod and fittings. From clothes to accessories, our Mannequins will not only satisfy your display needs, but also help your customers envision themselves in your products! Whether you are looking for children or adult sized mannequins, we offer them both in several different styles. These styles included faceless, molded hair with flesh tone, headless and more!At American Retail Supply we offer Mannequin forms in black, white and flesh tone finishes.